Craftster Community > CRAFTSTER CRAFT CHALLENGES > Archive of Past Craftster Challenge Entries > CHALLENGE 23 ENTRIES > Celtic Art takes a (Night) Stand! 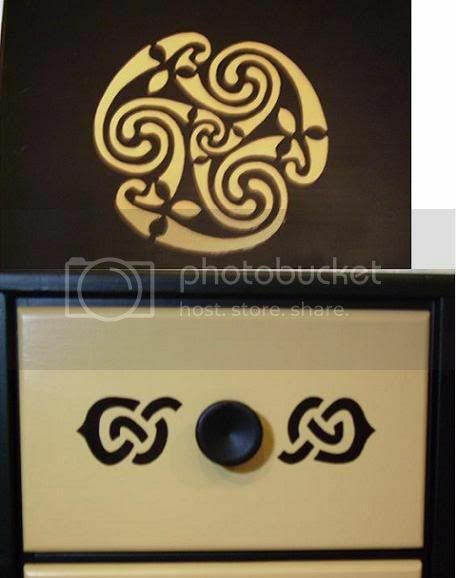 Celtic Art takes a (Night) Stand! Like another craftster mentioned, I didn't want to buy an item that I would not use. I found this nightstand at a thrift store for $5. If it had been mine, I would have tossed it in the trash! Two of the drawers were broken and three of the supports inside were loose. Someone had carved 'IL7' on the front, and it looked like it had really been kicked around. 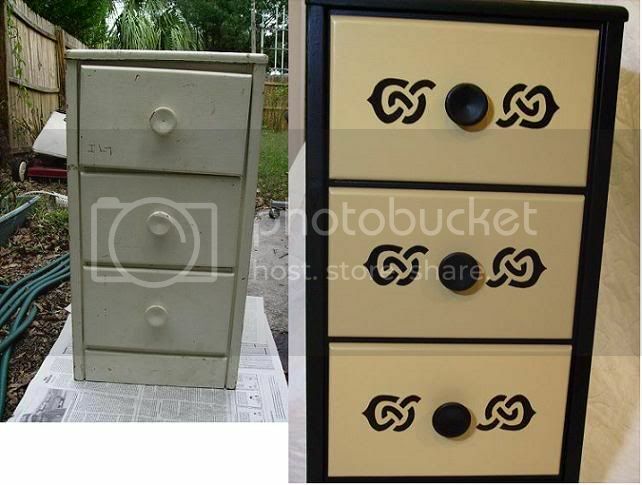 I didn't buy anything to transform this nightstand - I used items I already had (used my stash!). I sanded it all down and repaired the drawers and supports (with popsicle sticks!). The paint was left over from our living room. 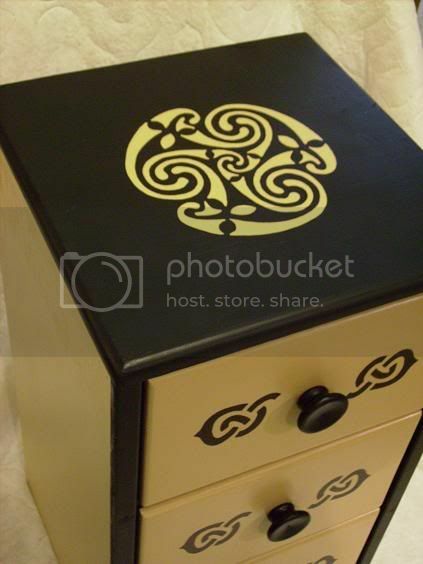 I stenciled the top and drawer fronts using designs I already had, and I lined the drawers with felt. I'll put this in the family room by my chair to hold crafting supplies. 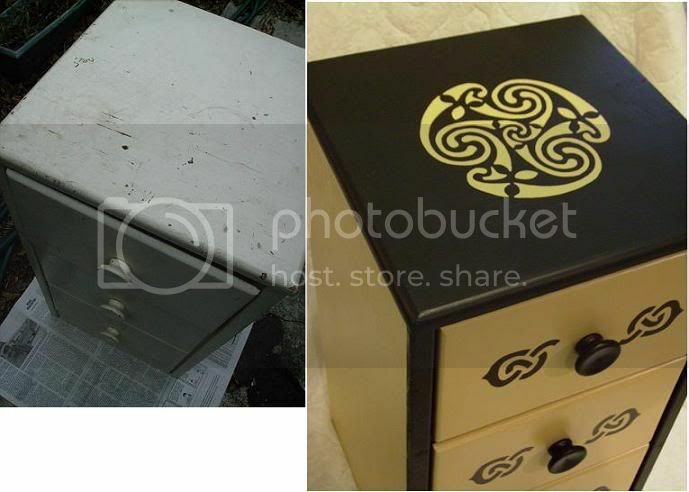 Re: Celtic Art takes a (Night) Stand! You took such a sad little piece of furniture and made it GORGEOUS! Great job!!! That turned out really really nice. I love the compact yet functional size of it. "Sad" - I used that word, too, when I first saw it. The drawers are actually quite spacious. A sheet of 8.5 x 11 paper fits in with room to spare. Great Job!!! Love the colors and designs you put on it. This turned out so beautifully. 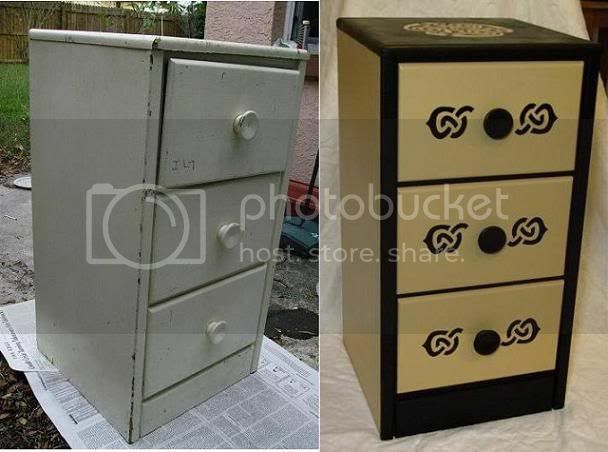 I had a night stand very similar to that, I finally gave up on its transformation but now I wish I had it back! Aren't you glad someone didn't throw it away? You made a one of a kind piece of furniture. Greener seems to fall beneath your feet. I love the stencil on the top! Where'd you find it? Did you create that pattern yourself? Beautiful work. Celtic Myths Shawl...with intarsia cableing..and it's all for me!